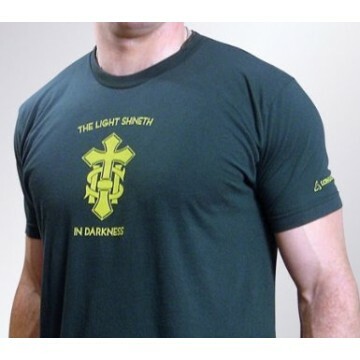 Green Shirt with Gold Symbol Symbol: IHS, the monogram for Jesus Christ Symbol History: The 'IHS' symbol is taken from the first three letters of Jesus's name in Greek: IHSOUS. 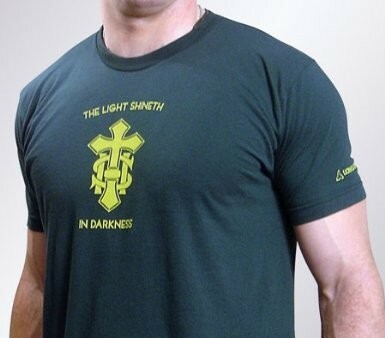 The monogram is often mistakingly interpreted as an acronym for "Jesous Hominum Salvatore", or Jesus, the Savior of men. Though the symbol dates back to the third century, it's popularity as a symbol for Jesus spread because of St. Vincent Ferrer and St. Bernadine of Siena in the fifteenth century. Later, St. Ignatius of Loyola used the symbol in the seal for the Society of Jesus. Artistic renditions abound for this monogram. The usage of a cross in the place of the "I" became common in eighteenth and nineteenth century gravestones. Scripture Passage: The phrase "The Light Shineth in Darkness" is taken from the Gospel of John (1:1-5): "In the beginning was the Word, and the Word was with God, and the Word was God. The same was in the beginning with God. All things were made by Him: and without Him was made nothing that was made. In Him was life, and the life was the light of men. And the light shineth in darkness, and the darkness did not comprehend it." Jesus is "The way, the truth, and the light." John 14:6.